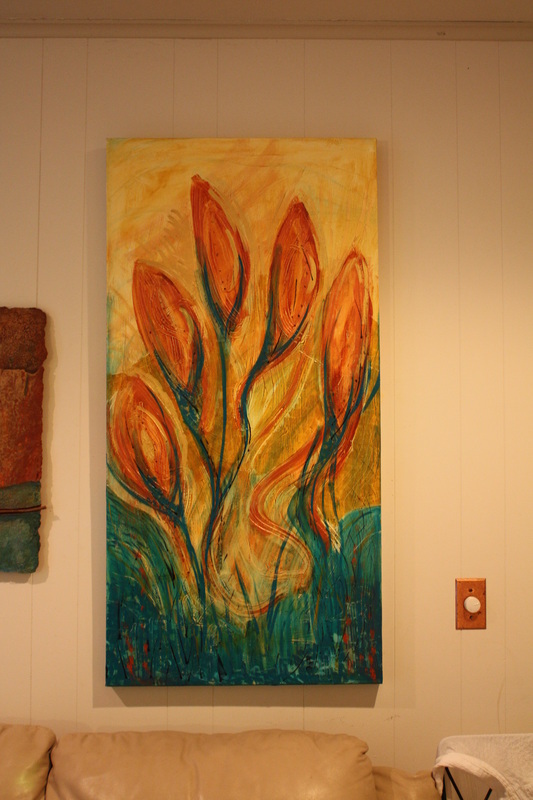 24" x 48" x 1 1/2"
This painting was created for the December 2011 Artfest in Bartlesville, Oklahoma. I prayed a great deal about Artfest's theme "Creation" and the scripture Colossians 1:16 - "For by Him all things were created, both in the heavens and on earth, visible and invisible, whether thrones or dominions or rulers or authorities - all things have been created through Him and for Him." fingerprints are all over the creation, just as God's unique and magnificent fingerprints are all over His Creation. My idea for "God's Fingerprints" painting included applying texture to the canvas that would look like fingerprints in an abstract manner. I intended the fingerprints to be in the background texture, almost unnoticeable. I created a thumb and four fingers in the background texture. As I began to apply paint, the image of budding flowers just emerged. I kept applying paint and the fingerprints of God were embedded in the five buds. Fingerprints were also under the flower bulb which represents the foundation and the beginning of life. The ground and the sky also revealed bearing God's fingerprints. The ground where the life emerges and the sky where all creation reaches up to receive lifegiving light and water. Toward the end of the painting experience, I realized that the colors also took on the fingerprints of God. The rich earth tones represented the creation of the earth, the red represented that life is in the blood - the blood that Jesus, God's only Son, shed for the salvation of man and the reconciliation of all of His creation. The golds represented the glory expressed when all creation is in the presence of the one and only Almighty Creator. I used acrylic paint and some oils to create the illusion of God's Fingerprints. We are all God's magnificent creations and we wear visibly and invisibly His Holy Fingerprints. "God's Fingerprints' is my humble creation intended to tell the story that God cherishes His creation and that we are beautiful and wonderfully made in His image, by His own loving Hands, and marked by His own glorious fingerprints. 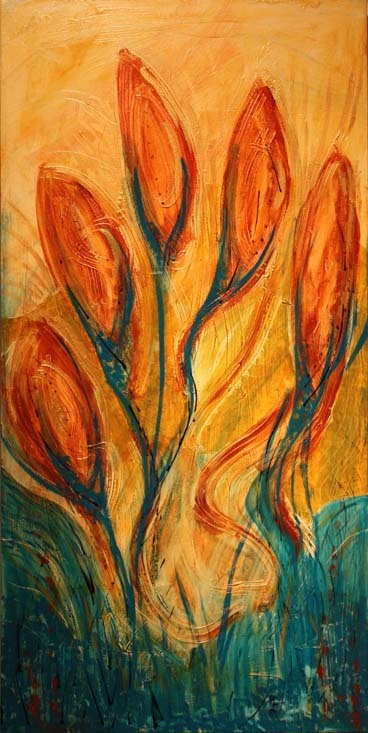 "God's Fingerprints" was awarded Honorable Mention at the 2011 Artfest juried art show.